O reported speech (discurso indireto) é utilizado na língua inglesa para contar algo que foi dito por alguém, sem reproduzir exatamente as mesmas falas. É muito comum vermos questões com reported speech em provas de vestibulares, do Enem e até mesmo de concursos públicos. Aqui você encontra uma série de exercícios para praticar e aprender de uma vez por todas como o discurso indireto é utilizado em inglês. TEXT 1 below, retrieved and adapted from https://chroniclingamerica. loc.gov/lccn/sn83035487/1851-06-21/ed-1/seq-4/ on July 9th, 2018. "May I say a few words?" Receiving an affirmative answer, she proceeded: I want to say a few words about this matter. I am a woman's rights. I have as much muscle as any man and can do as much work as any man. I have plowed and reaped and husked and chopped and mowed, and can any man do more than that? I have heard much about the sexes being equal. I can carry as much as any man, and can eat as much too, if I can get it. I am as strong as any man that is now. As for intellect, all I can say is, if a woman has a pint, and a man a quart -- why can't she have her little pint full? You need not be afraid to give us our rights for fear we will take too much; -- for we can't take more than our pint will hold. The poor men seem to be all in confusion, and don't know what to do. Why children, if you have woman's rights, give it to her and you will feel better. You will have your own rights, and they won't be so much trouble. I can't read, but I can hear. I have heard the bible and have learned that Eve caused man to sin. Well, if a woman upset the world, do give her a chance to set it right side up again. The Lady has spoken about Jesus, how he never spurned woman from him, and she was right. When Lazarus died, Mary and Martha came to him with faith and love and besought him to raise their brother. And Jesus wept and Lazarus came forth. And how came Jesus into the world? Through God who created him and the woman who bore him. Man, where was your part? But the women are coming up blessed be God and a few of the men are coming up with them. But man is in a tight place, the poor slave is on him, woman is coming on him, he is surely between a hawk and a buzzard. Reference: Robinson, M. (1851, June 21). Women’s rights convention: Sojourner Truth. Anti-slavery Bugle, vol. 6 no. 41, Page 160. I have as much muscle as any man, and can do as much work as any man. a) she said that she had had as much muscle as any man and she could have done as much work as any man. b) she said that she had as much muscle as any man and she could do as much work as any man. c) she spoke that she has as much muscle as any man and she could do as much work as any man. d) she said that she had as much muscle as any man and she can do as much work as any man. e) she told that she had as much muscle as any man and she could do as much work as any man. Alternativa correta: b) she said that she had as much muscle as any man and she could do as much work as any man. Ao escrevermos um reported speech, devemos lembrar que há relações obrigatórias entre os verbos que estão no discurso direto e os que estão no discurso indireto. Tendo em conta a frase acima, a resposta correta é a letra b) pois quando o verbo está no Simple Present no discurso direto, ele deve passar para o Simple Past no discurso indireto. “I have” passou a “I had” e “can do” passou a “could do”. Based on text 2, an adapted forum discussion, answer question below. I have started teaching in a language school suggesting no books to teach except for some magazines. These show the framework what should be worked on, for example, countability and that’s it. When it was offered I accepted the job easily because it seemed challenging and at the same time simple but now I’m out of reliable materials. Please help me out in what ways I can find materials for all the suggested frameworks. What exactly are you supposed to be teaching (i.e., conversation, grammar, business English, etc.)? Can you give more examples of the “frameworks”? If there are no books or resources, it sounds like the school wants you to do conversation classes. These can be easy to prepare if you tell the students to come prepared with a topic to discuss. Then, you can assist them with keeping a conversation going, asking questions, giving opinions, etc. Hi, I think it really does depend on the students and the level you are teaching to. I have found a lot of online resources are useful, especially news articles. If you just type in “Free online English lessons” or something similar you are bound to find resources. I had to teach like that once. They give you a book with a list of what you should be teaching in each lesson but nothing else. The teacher has to make the lesson up out of thin air each time, and it’s pretty time-consuming. There are so many other resources out there for teachers to use, online and off, that teaching without textbooks is becoming more and more acceptable including websites, iPod lectures and field trips — that will encourage you to toss out your textbooks. Before you can toss out the textbook and replace it with technology tools, you’ll need to understand how your students — whatever their age — respond to and work with technology. Observe que apesar de um reported speech que faz referência a um discurso direto e corresponde a uma pergunta geralmente iniciar com o verbo “asked” (perguntou), na resposta correta acima, o “asked” foi utilizado com o significado “pediu”. Veja que no discurso direto temos “Can you give me...”, que significa “Você pode me dar...”, o que indica um pedido. O verbo pedir, em inglês, é “to ask”. Caso tenha tido dúvidas em relação à resposta d) devido ao uso de "asked", observe que nesse caso o significado é "perguntou" e além disso, a frase refere que Mila fez uma pergunta a Jake, quando na verdade a pergunta de Mila foi para Dianne Bell. Importante: não se prenda apenas a análises verbais e outras relações obrigatórias entre discursos diretos e discursos indiretos! Muitas vezes a chave da resposta está no sentido das frases. An old man plays his cello at the foot of a crumbling wall. 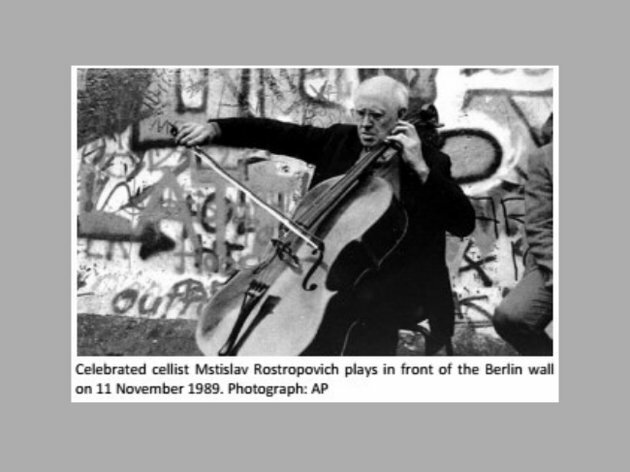 The notes of the sarabande of Bach’s Suite No 2 rise in the cold air, praising God for the “miracle” of the fall of the Berlin Wall, as Mstislav Rostropovich later put it. The photograph is seen around the world. The date is 11 November 1989, and the Russian virtuoso is marching to the beat of history. Curiously, the study of the role of music in international relations is still in its infancy. “Historians must have long seen it as something fanciful, because history has long been dominated by interpretations that stress economic, social and political factors,” says Anaïs Fléchet, a lecturer in contemporary history at the Université de Versailles-St-Quentin and co-editor of a book about music and globalisation. Since then, every embassy has a cultural attaché. The US engages in “audio diplomacy” by financing hip-hop festivals in the Middle East. China promotes opera in neighbouring states to project an image of harmony. Brazil has invested in culture to assert itself as a leader in Latin America, notably by establishing close collaboration between its ministries of foreign affairs and culture; musician Gilberto Gil was culture minister during Luiz Inácio Lula da Silva᾽s presidency from 2003 to 2008. He was involved in France’s Year of Brazil. As Fléchet recalls, “the free concert he gave on 13 July, 2005 at the Place de la Bastille was the pinnacle. 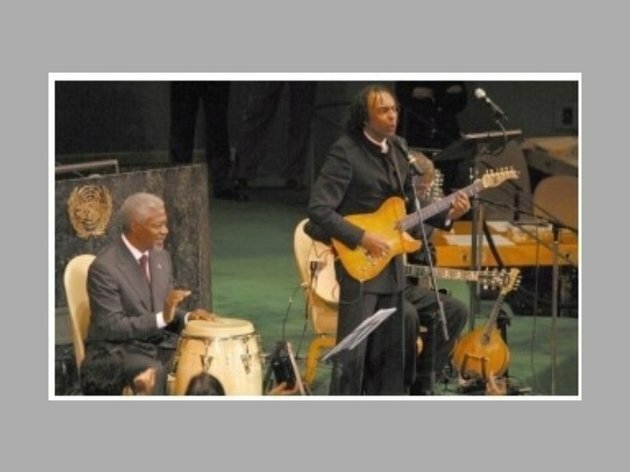 That day, he sang La Marseillaise in the presence of presidents Lula and Jacques Chirac.” Two years earlier, in September 2003, Gil sang at the UN in honour of the victims of the 19 August bombing of the UN headquartes in Baghdad. He was delivering a message of peace, criticising the war on Iraq by the US: “There is no point in preaching security without giving a thought to respecting others,” he told his audience. Closing the concert, he invited then UN secretary general Kofi Annan on stage for a surprise appearance as a percussionist. “This highly symbolic image, which highlighted the conviction that culture can play a role in bringing people together, shows how music can become a political language,” Fléchet says. e) Analyst Frédéric Ramel has said that musicians are creating a dialogue and arriving at common policies. Para chegar à resposta correta, é preciso analisar a relação entre os verbos do discurso direto e os verbos do discurso indireto nas sugestões de resposta. Na frase original, note que foram usados dois verbos no Simple Present: “create” (criar) e “arrive” (chegar). Sempre que um verbo está no Simple Present no discurso direto, no discurso indireto ele deve ser conjugado no Simple Past. Sendo assim, "says" passou a "said", "create" passou a "created" e "arrive" passou a "arrived". Com isso, podemos perceber que apesar de a resposta b apresentar os verbos “create” e "arrive" conjugados corretamente no discurso indireto ("created" e "arrived"), a frase está errada pois o verbo "says" foi mantido no Simple Present. 4. (Unirio/2000) "How would you describe yourself?" is a direct question. Complete the sentence below with the appropriate indirect question form. Observe que o discurso direto apresenta um pronome reflexivo (yourself= você mesmo). A pergunta feita por Daniel Hart é direcionada a um(a) adolescente (teenager). Apesar de não sabermos se a palavra teenager (adolescente) se refere a um menino ou a uma menina (já que os substantivos em inglês não têm gênero), sabemos que o pronome “yourself” deverá ser alterado para a terceira pessoa do singular, neste caso “himself” (ele mesmo) ou “herself” (ela mesma), visto que “itself” não é utilizado para fazer referência a pessoas. Sendo assim, podemos perceber que apenas duas das opções podem ser possíveis: a letra c) e a letra d). Repare que, se optarmos pela letra d, estaremos dizendo o seguinte: “Daniel Hart pediu a um(a) adolescente afro-americano(a) que ele(a) se descrevesse.” Para que essa fosse a opção correta, o discurso direto de Daniel Hart deveria ser "Describe yourself." No entanto, o que Daniel faz é perguntar como o(a) adolescente se descreveria. Assim sendo, uma simples análise do significado das frases conduz à resposta correta. Importante: observe que ao passar a frase para o discurso indireto, o verbo e o pronome pessoal trocaram de posição, ou seja “... would he...” passou a “...he would...”. O pronome pessoal só vem depois do verbo em perguntas diretas. 5. (Fatec/2002) Considere a frase "It's a perfect setup for heart disease and diabetes, says Stampfer." Assinale a alternativa em que a transposição dessa frase para o discurso indireto está correta, completando a frase a seguir. a) it was a perfect setup for heart disease and diabetes. b) it is a perfect setup for heart disease and diabetes. c) it has been a perfect setup for heart disease and diabetes. d) it had been a perfect setup for heart disease and diabetes. e) it will be a perfect setup for heart disease and diabetes. Alternativa correta: b) it is a perfect setup for heart disease and diabetes. Observe que o que define a resposta correta do exercício acima é o uso de “says” na introdução do discurso. Quando o discurso indireto é introduzido por um verbo na terceira pessoa do singular do Simple Present (nesse caso "says"), os demais verbos principais da frase também devem estar no Simple Present. Esse tipo de frase geralmente indica uma ideia que continua verdadeira e, por esse motivo, não é necessário alterar o tempo verbal. Veja que, das opções de respostas apresentadas, a única onde o verbo está no Simple Present é a letra b), onde temos o verbo to be flexionado como "is". a) They said that did parents know their kids? b) They asked that parents know their kids. c) They said that parents knew the kids. d) They argued that do parents know their kids. e) They asked if parents knew their kids. Alternativa correta: e) They asked if parents knew their kids. Em discursos indiretos que façam referência a perguntas, o verbo que introduz o discurso é o asked (perguntou). Assim sendo, ficamos apenas com duas respostas possíveis: letra b) e letra e). Observe que na letra b), há um erro gramatical em “asked that” (perguntou que). A forma correta é “asked if” (perguntou se). Além disso, veja que o verbo principal (know) não foi conjugado no passado como deveria (knew). Sendo assim, a letra e) é a única resposta possível. a) if I won’t feed my Tamgotchi, it would die. b) if you didn’t feed your Tamagotchi, it had died. c) if I didn’t feed my Tamagotchi, it would have died. d) if I didn’t feed my Tamagotchi, it would die. e) if you haven’t fed your Tamagotchi, it will have died. Alternativa correta: d) if I didn’t feed my Tamagotchi, it would die. Para chegar à resposta correta, é preciso considerar a frase como um todo. Primeiramente, lembre-se que o pronome pessoal “you” do discurso direto passa a “I”, quando quem profere o discurso indireto é a mesma pessoa a quem o “you” se refere. Depois, é preciso prestar atenção nos verbos principais da frase. Quando o discurso direto apresenta o verbo “will”, no discurso indireto ele passa a “would”. Já o verbo auxiliar “don’t” passa para “didn’t”. a) A man asked a girl what was her father's job. b) A man asked a girl her father was job. c) A man asked a girl what her father's job was. d) A man asked a girl was what her father was job. e) A man asked a girl what hers father's job was. Alternativa correta: c) A man asked a girl what her father's job was. Quando a palavra what (qual/o que) está presente no discurso direto, ela deve ser usada no discurso indireto também. Tendo em conta as opções acima, apenas as letras a), c) e e) são consideráveis. Veja que na frase a, a estrutura é what+ was+her father’s job. Essa estrutura só deveria ter sido usada se se tratasse de uma pergunta direta. Restam agora as letras c) e e). Observe que na letra e temos um erro gramatical: o pronome objeto (hers) nunca deve ser acompanhado do elemento ao qual ele se refere (nesse caso, father). Veja que a segunda parte da frase não menciona o elemento ao qual o pronome hers se refere, nesse caso a palavra bedroom (quarto). Dito isso, apenas a letra c) está correta. In Reported Speech, this sentence becomes: Rossano Amadelli said that he _______________ it to work, but not so well. Alternativa correta: a) had expected. Observe que quando o verbo principal do discurso direto está no Simple Past, ele passa para o discurso indireto conjugado no Past Perfect. Assim sendo, “expected” passou a “had expected”. 10. (Escola Naval/2009) Mary saw her boyfriend with another girl and they had a quarrel. She shouted: "Don't come here anymore!" Which alternative best reports what she said? a) She said her boyfriend do not come here anymore. c) She said to her boyfriend to not to go there anymore. e) She told her boyfriend not to go there anymore. Alternativa correta: e) She told her boyfriend not to go there anymore. Observe que, em frases no discurso indireto, “don’t + verbo” deve passar a “not to + verbo”, “come” deve passar a “go” e “here” deve passar a “there”. 11. (Escola Naval/2010) Mary saw James, her doctor, two days ago. James said: "See me tomorrow again." Which alternative best reports what he said? a) He said Mary will see him tomorrow. b) He told to her to see him the day after. c) He said to her to see him tomorrow. d) He told her to see him the day after. e) He told her to see him the day after tomorrow. Alternativa correta: d) He told her to see him the day after. Sempre que a palavra “tomorrow” é usada no discurso direto, ela é substituída por “the day after” no discurso indireto. Alternativa correta: b) my car was. A alternativa b) é a correta pois no discurso indireto, a pergunta também deve ser feita de forma indireta. Sendo assim, a ordem não pode ser “verbo+pronome pessoal 'my'+car” (“...was my car...?). Assim sendo, as letras a), c) e e) estão incorretas. Importante: regra geral, quando temos um verbo no Simple Present no discurso direto, ele passa a ser conjugado no Simple Past no discurso indireto.